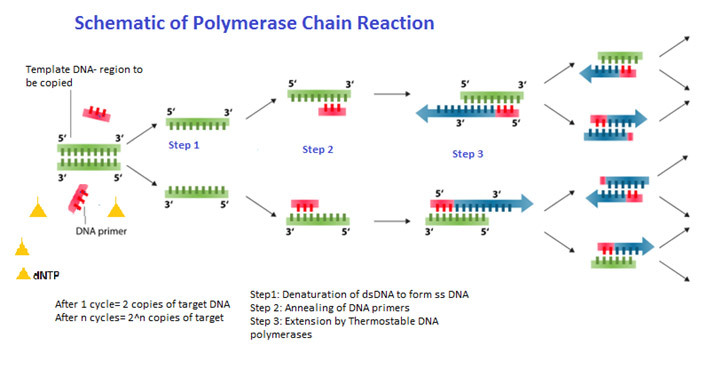 PCR (Polymerase Chain Reaction) is a key tool that changed the field of molecular biology. 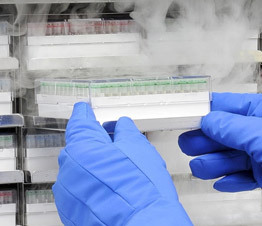 This technique has become an integral part of other workflows such as cloning, gene expression analysis, genotyping, sequencing, and several others. PCR has been critical in the evolution of biological applications as it allows amplification of very limited biological samples for use in environmental, clinical diagnostics & forensic studies. 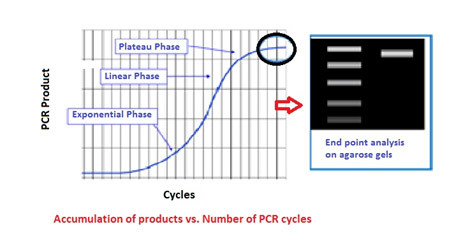 The typical PCR reaction (also called end-point PCR) yields qualitative data. 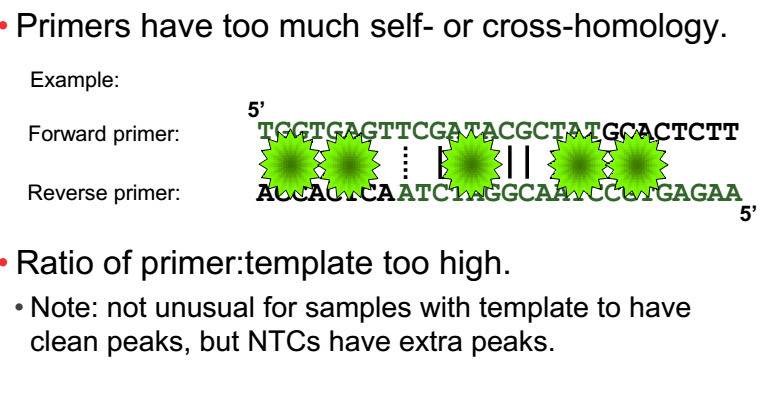 RNA cannot be used directly as a template for PCR or Real-Time PCR. The Taq polymerases employed during PCR amplification are DNA template dependent DNA polymerases. Hence, when working with RNA an additional step, Reverse Transcription (RT) is necessary to generate cDNA (complementary to RNA sequence). Reverse transcriptase’s are enzymes isolated from viruses with a RNA genome. These viruses utilize reverse transcriptase’s to generate cDNA in the process to replicate and re-create more viral particles in the host they attack. 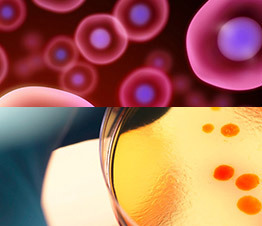 Typically RT used for molecular biology applications have been obtained from Mouse Murine Leukemia virus (M-MLV), Avian Myeloblastosis Virus (AMV), or are derivatives of these enzymes. To note, reverse transcriptase enzyme is also found in retroviruses and use for integration of cDNA during integration into the host genome. 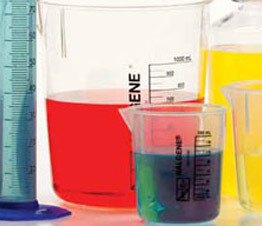 To set up the RT reaction, RNA of good quality (free of gDNA) is necessary. 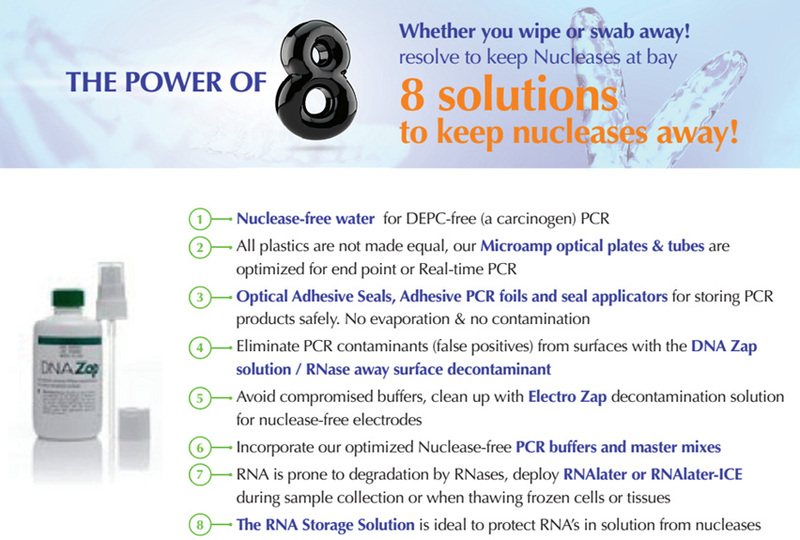 Use of DNase I enzymes such as Turbo DNA-free or DNase I should be employed. 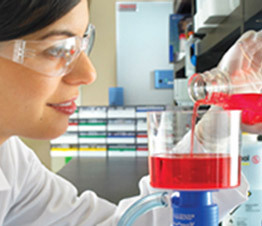 RNA is combined with dNTP’s and requisite buffers (SuperScript IV VILO Master Mix) and RT enzyme (at 50-55°C) to generate the cDNA. 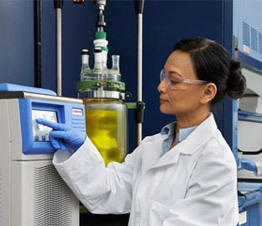 cDNA can be measured using spectrophotometer or a Qubit fluorimeter. 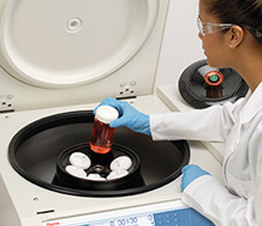 PCR reaction set up and choice of reagents depends on the length of product to be generated (amplicon size), AT or GC content of the DNA being amplified and downstream applications. 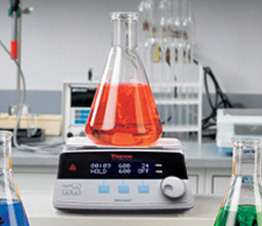 Hence, different formulations of buffers, dNTPs, primers and annealing parameters need to be tested. 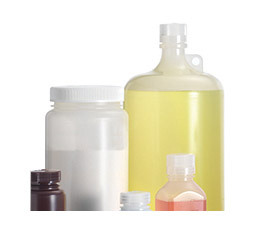 A wide selection of thermostable enzymes for thermal cycling can be employed. Notable among them, AmpliTaq and AmpliTaq Gold, Invitrogen Platinum Taq, AccuPrime, and Platinum SuperFi DNA polymerases have been used and cited often. 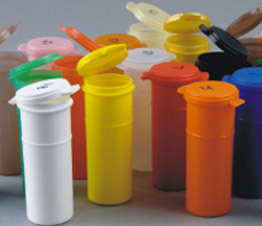 Choice of the right plastics is critical. Schema of a MicoAmp plastic plate is shown below. 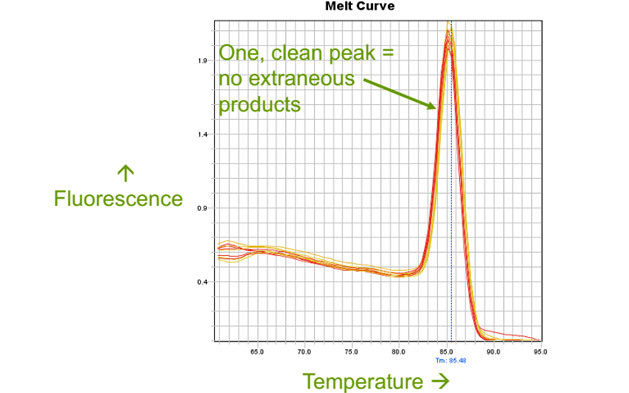 Real-Time PCR (qPCR) is a quantitative tool allowing measurement of product generation as fluorophore intensity after each thermal cycling step. Hence data is captured in real-time. qPCR is highly sensitive and utilized in many clinical diagnostic, forensic and genotyping applications. 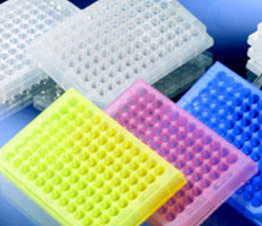 Qualitative and semi- quantitative Quantitative and used for copy number studies and Gene expression studies. High accurate quantitation of target in sample. Ten common pitfalls to avoid in a Real-Time PCR experiment. With blood or plant samples it is necessary to remove Haeme or chlorophyll from the sample as they can inhibit fluorescence. 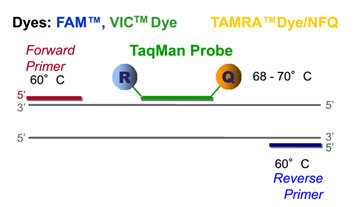 The two key chemistries used for Real-Time PCR are the SYBR Green (dsDNA dye binding) and the TaqMan Probe based chemistry. 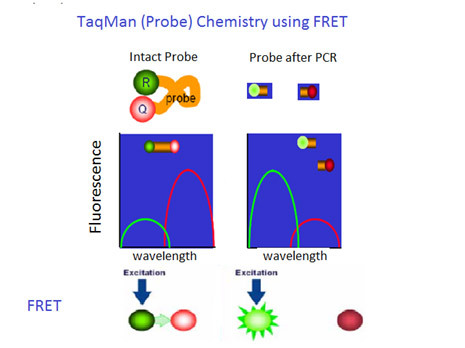 The TaqMan chemistry incorporates the principle of FRET (Fluorescence Resonance Energy Transfer). During the annealing step of the PCR, a probe specific for the target DNA binds between the two end primers. This probe is designed with a Fluor and a quencher on opposite ends. When the probe is intact, the Fluorophore and Quencher juxtapose each other transferring energy from the fluorophore to the quencher resulting in no fluorescent signal. 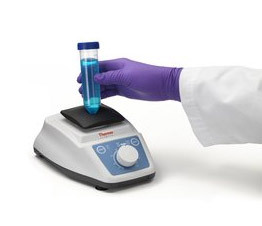 Newer TaqMan probes incorporate a Non-fluorescing quencher and a Minor Groove Binder molecule to stabilize binding of probe to template requiring smaller size probes 25-30 bases. During the extension step, the Taq DNA polymerase cleaves the probe releasing the fluorescent molecule into solution- emitting fluorescence. 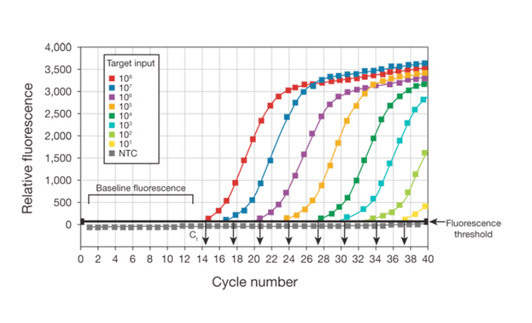 The fluorescence emitted is proportional to the amount of target products generated each cycle. Fluorescence increases after each cycle. (See Figure TaqMan Probe Chemistry using FRET). 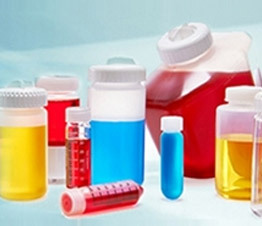 For SYBR green analysis, it is necessary to optimize the reaction and ensure an unique product is generated after the reaction. 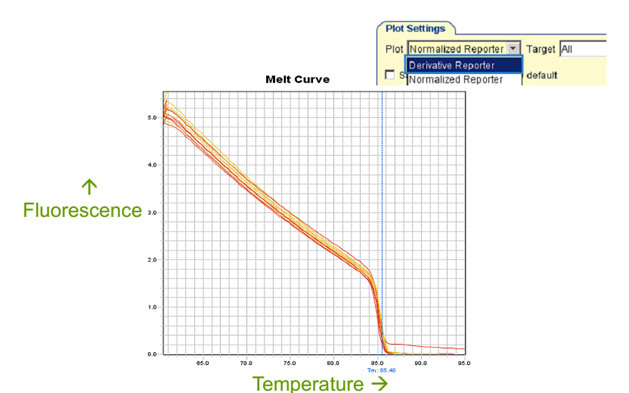 The melt curve and its derivative plots allow analysis of products after thermal cycling. A single peak with no extraneous products depicts a successful SYBR green experiment. 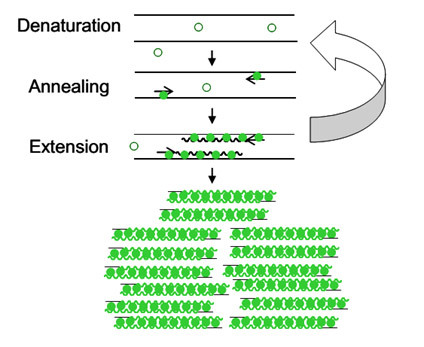 It is important in SYBR green optimization that the forward and reverse primers do not have too much cross-homology as this can result in primer-dimers which will bind the dye. Sometimes the non-template control (NTC) can show extra peaks in a melt curve if primer: template ratio’s are kept very high. corrected against an internal reference dye (ROX) present in the reaction buffer. This normalized fluorescence (called Rn) is plotted against Cycle number. 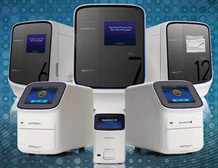 Typical quantitation experiments measure Relative, Absolute levels of the target gene in the sample or copy number variations of genomic DNA in a sample. Occasionally presence/absence experiments (Example: viral or infectious agent presence) are deployed without quantifying actual target. 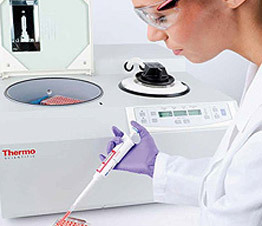 It is necessary for the accuracy of measurements that all targets are amplified at a high PCR efficiency (80-100%). 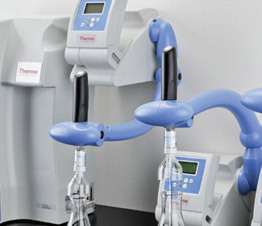 Baseline measurements are used to remove an extraneous fluorescence or noise in the system. copy of target can ideally be measured before this cycle number. Read more about Ct values . Multiple software are available for Real-Time data analysis. 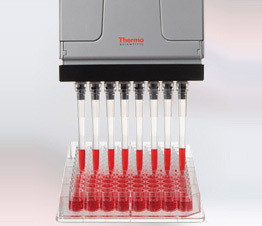 Typically used for studies of Gene Expression, Relative quantitation reports target gene abundance as a ratio (fold measurement) in samples under different experimental conditions. Accuracy of these measurements hinge on the choice of the right endogenous controls. 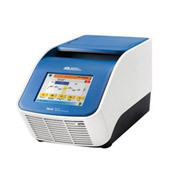 Absolute quantitation is typically used in clinical samples or GMO testing. Here absolute copy number of a virus or a target is measured. This measurement correlates the Ct value of a target gene in the sample against a standard curve plot (Ct values of 10-fold dilutions of target vs. Log copy number). 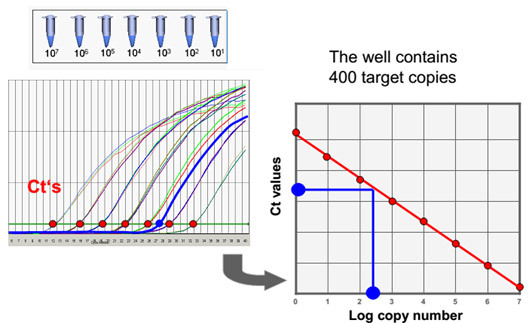 Digital PCR is a novel approach to exact copy number (quantification) of a target in the biological sample. 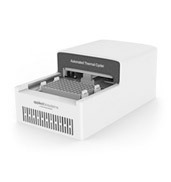 This technique is useful for analysis of rare genes, targets and applications such as viral detection, GMO detection and liquid biopsy. 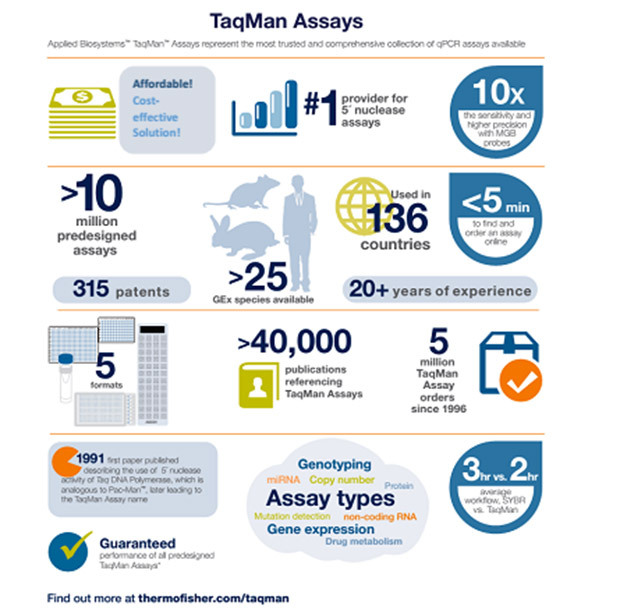 The technique utilizes the TaqMan real-time PCR chemistry along with partitioning of input DNA or cDNA. 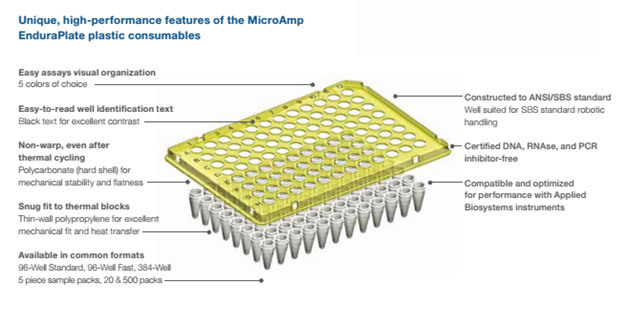 The input material is dispersed into a nano-fluidic chip containing thousands of wells. The resulting partitioning results in some wells containing the input materials and many others with no input. Wells which received multiple input target copies are corrected using a Poisson model of distribution. and larger sample volumes can be deployed. Identification of viruses and pathogens in food an water that can cause illness. 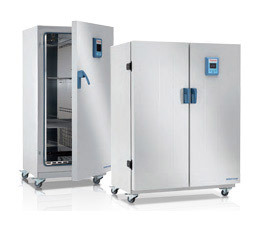 Especially useful if low level of pathogens. While digital PCR does not require reference standards, it can be used as a tool when generating such materials for other experiments. 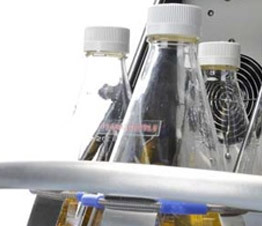 As a tool used for standard and reference generation, the ease of use means that several references can be deployed to suit the complex biology required by a given experiment. 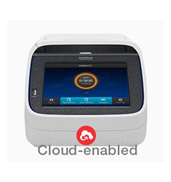 The data from the ™ QuantStudio™ 3D Digital PCR instrument is analyzed with a special software- QuantStudio™ 3D Analysis Suite™ Cloud Software. 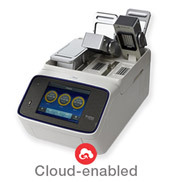 Since digital PCR is based on partitioning, the data from a single chip (of 20K wells) is collected together in a single experiment data (.eds) file. This file is a composite of the processed imaging data + all results from preliminary analysis. The data can be interpreted to generate relative quantification (RQ) or absolute quantification results. Data can be stored in the cloud or on a local network server depending on the user’s needs.